This black jacket has an Asian character design done in gold thread. It has a shirt collar, a 1-button closing on the waistband, and long sleeves with 1-button band cuffs. 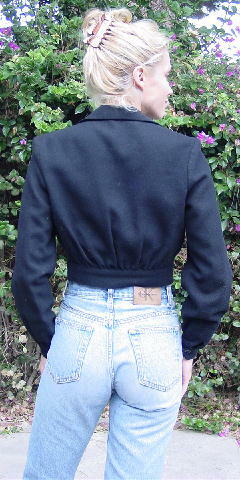 There is gathering extending upward from the back waistband. Wear it with a skirt, pants, or jeans.